In ethics, value denotes the degree of importance of some thing or action, with the aim of determining what actions are best to do or what way is best to live (deontology), or to describe the significance of different actions (axiology). It may be described as treating actions themselves as abstract objects, putting value to them. It deals with right conduct and good life, in the sense that a highly, or at least relatively highly, valuable action may be regarded as ethically "good" (adjective sense), and an action of low in value, or somewhat relatively low in value, may be regarded as "bad". What makes an action valuable may in turn depend on the ethic values of the objects it increases, decreases or alters. An object with "ethic value" may be termed an "ethic or philosophic good" (noun sense). Values may help solve common human problems for survival by comparative rankings of value, the results of which provide answers to questions of why people do what they do and in what order they choose to do them. 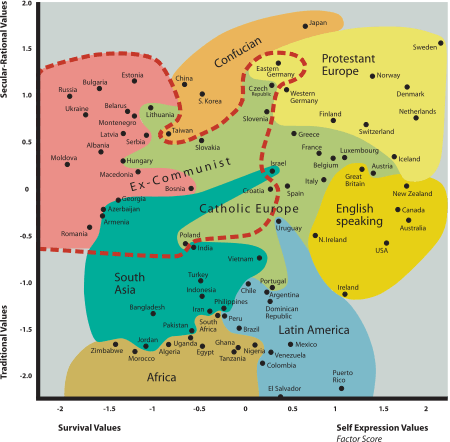 Moral, religious, and personal values, when held rigidly, may also give rise to conflicts that result from a clash between differing world views. Individual cultures emphasize values which their members broadly share. One can often identify the values of a society by noting which people receive honor or respect. In the United States of America, for example, professional athletes at the top levels in some sports receive more honor (measured in terms of monetary payment) than university professors. Surveys show that voters in the United States would not willingly elect an atheist as president, suggesting belief in a God as a generally shared value. Furthermore, institutions in the global economy can genuinely respect values which are of three kinds based on a "triangle of coherence". In the first instance, a value may come to expression within the World Trade Organization (WTO), as well as (in the second instance) within the United Nations - particularly in the Educational, Scientific and Cultural Organization (UNESCO) - providing a framework for global legitimacy through accountability. In the third instance, the expertise of member-driven international organizations and civil society depends on the incorporation of flexibility in the rules, to preserve the expression of identity in a globalized world. Intrinsic and instrumental goods are not mutually exclusive categories. Some objects are both good in themselves, and also good for getting other objects that are good. "Understanding science" may be such a good, being both worthwhile in and of itself, and as a means of achieving other goods. In these cases, the sum of instrumental (specifically the all instrumental value) and instrinsic value of an object may be used when putting that object in value systems, which is a set of consistent values and measures. Protected values have been found to be play a role in protracted conflicts (e.g., the Israeli-Palestinian conflict) because they can hinder businesslike (''utilitarian'') negotiations. From the perspective of utilitarianism, protected values are biases when they prevent utility from being maximized across individuals. Clyde Kluckhohn and his Value Orientation Theory. ↑ Maiese, Michelle. "Causes of Disputes and Conflicts." Beyond Intractability. Ed. Guy Burgess and Heidi Burgess. Conflict Research Consortium, University of Colorado, Boulder, Colorado, USA. October 2003. Downloaded 13 February 2016. ↑ Hacker, Violaine (2011a), "Building Medias Industry while promoting a community of values in the globalization: from quixotic choices to pragmatic boon for EU Citizens", Politické Védy-Journal of Political Science, Slovakia, pp. 64-74. 1 2 3 4 5 6 7 Day, Nicholas (10 April 2013). "Parental ethnotheories and how parents in America differ from parents everywhere else.". Slate. Retrieved 19 April 2013. ↑ Tetlock, Philip E. "Thinking the unthinkable: sacred values and taboo cognitions". Trends in Cognitive Sciences. 7 (7): 320–324. doi:10.1016/s1364-6613(03)00135-9. ↑ Atran, Scott; Ginges, Jeremy (2012-05-18). "Religious and Sacred Imperatives in Human Conflict". Science. 336 (6083): 855–857. doi:10.1126/science.1216902. ISSN 0036-8075. PMID 22605762. ↑ Baron, Ilana, Jonatha, Ritov (2009). Protected Values and omissions Bias as Deontological Judgements (PDF). Elsevier Inc. pp. 134, 135. ↑ Baron, Jonathan and Spranca, Mark (1997). "Protected values". Organizational Behavior and Human Decision Processes. 70(1), 1-16.